This report gives an update on the performance, and on every holding, across our Blue Harbinger strategies. And as the market has sold off, we believe increasingly attractive opportunities have emerged for new purchasers, as described in this report. 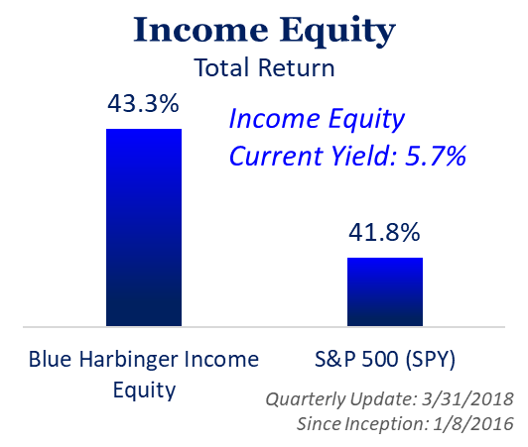 The Income Equity portfolio continues its long-term track record of outperforming the market, and it also provides a much higher yield that the overall market (for example, the S&P 500 currently yields only around 1.85%). Further, the S&P 500 (SPY) was down 6.3% during the reporting period (Feb-March) whereas the Income Equity portfolio was down less, only -5.5%. Plus the outsized yield on this strategy makes the pullbacks more palatable. Our largest holdings in this strategy are all attractive funds. They're attractive in their own right (as we'll cover later), but they're also attractive for diversification benefits. The Income Equity is a concentrated strategy with only 20 holdings. However, the last 5 names in the above table are all funds with many holdings. This is very important for risk-reduction (diversification) reasons. The right level of diversification can keep your expected returns high and your risk relatively low. 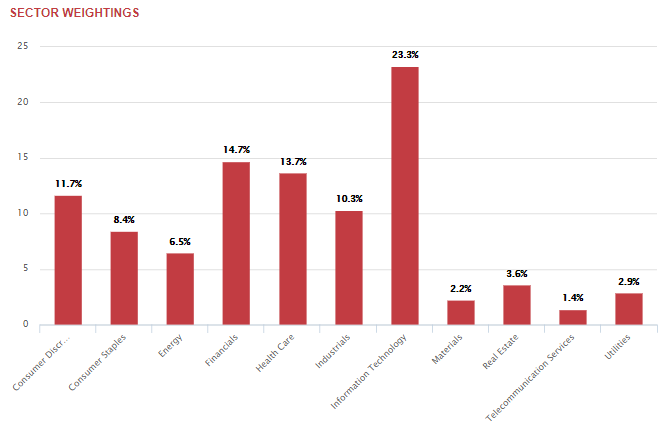 The individual "non-fund" holdings are also somewhat diversified across sectors. It's generally a bad idea to concentrate your investments entirely in one or two types of investments (for example, investors often make the mistake of putting every thing into all REITs or all MLP, only to be frustrated when those segments of the market suffer a setback). Also, while the market turned south over the latest March-Feb reporting period (SPY was down 6.3%), Disciplined Growth was down slightly less (-6.1%). However, it is long-term capital appreciation that this strategy seeks, and month-to-month performance is simply too short of a time frame to worry about (i.e some volatility is to be expected). This is a concentrated strategy, even more so than the Income Equity strategy. The individual holding in Disciplined Growth have higher weights than Income Equity, and the amount of diversified funds (in this case IWN, XLV and IXUS) is lower. We continue to look for new opportunities to add to this portfolio. Some names on our watch list include: Square (SQ), Simon Property Group (SPG), and Teekay Corporation common shares (TK). Accenture (ACN): Buy low. Accenture is a global juggernaut professional services firm, and the company's greatest asset is its people. The shares have pulled back from over $160 to around $153 as the overall market has pulled back, but nothing has changed as Accenture continues to benefit from a strong global economy. Accenture beat Q2 earnings estimates and raised its revenue guidance. Street estimates are calling for this stock to go much higher. 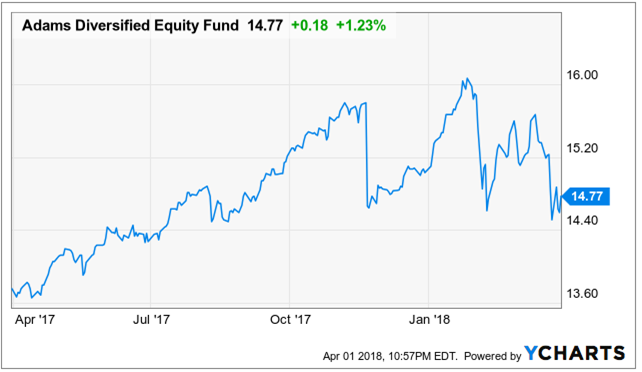 Adams Diversified Equity Fund: This closed-end fund has been paying a dividend since 1929, and the yield was 9.8% in 2017 (the fund targets a minimum annual yield of at least 6%, but pays higher depending on market conditions. We like the high-yield, the conservative management, the discount to NAV (currently -14.7%), and the recent price pullback. Here is a look at the fund's sector diversification. We wrote in more detail about ADX a couple months ago in this report and previously in these articles. American Express Company: AXP has data on affluent customers and deal with merchants that will allow the company to structure valuable rewards programs and attract more customers. Plus, the company's decision to allow third party cards will expand business further. The street believes this stock has upside (the average price target is $108.74, the current price is $92.31). AmeriGas Partners (APU): This propane distributor sold off recently despite the relatively colder winter which will help business. The distribution 9.4% yield is juicy, steady and attractive, but investors should be congnizant of the MLP tax status. Automatic Data Processing (ADP): This is a steady dividend that has been increasing every year for 40 years. The economy remains strong, but the share price has pulled back. Buying opportunity in our view. A potential threat to ADP is the smaller cloud-based SaaS competitors (such as Paylocity, which we cover later), but there is plenty of steady long-term business to keep ADP profitable and growing for years. Eastgroup Properties (EGP): We like this industrial REIT and it is trading at an attractive price after pulling back in recent months. Investors are scared of the possible negative impacts of rising interest rates on REITs, but if rates are rising that means the economy is strong and EastGroup will benefit, especially considering its attractive location industrial properties. You can read our previously EGP write-up here. Emerson Electric (EMR): Emerson has a reputation for automating industrial processes, and its newly streamlined portfolio continues to go strong, particularly in emerging markets. Emerson has a long history of returning healthy free cash flows to investors via growing dividends and share buybacks. Like the rest of the market, the shares have pulled back in recent weeks, thereby making for an attractive buying opportunity, especially considering the economy remains strong. 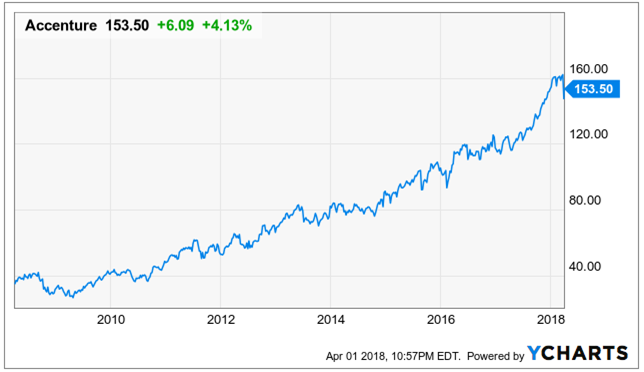 Facebook (FB): We've ridden this stock from $27 per share to its current price of $159, but Facebook has been under significant pressure lately as a result of ongoing news about how the company is sharing user information. CEO Mark Zuckerberg defends the sale of user information to advertisers as the only viable way to provide a free service to many users that could not afford to pay for Facebook anyway. We view the selloff as a buying opportunity, and believe Facebook still has enormous and growing revenue generation power from advertisers. Ferrellgas 2020 Bonds 8.625%: We believe the bonds of this propane distributor have the cash flow to support their debts (especially after this relatively cold winter), and these bonds are relatively safe and attractive. These are the first of multiple years of maturities (as shown in the following table) thereby adding to safety, in our view. The equity is suffering as the distribution was cut over a year ago, and as financials continue to be tight. The bonds are ahead of the equity in the capital structure, and these bonds are attractrive. First American Financial (FAF): This stock of this wide-moat title insurance company have been on fire in recent years as they are the main game in town as the housing market has continue to recover. The dividend yield has fallen as the share price has risen, but the company (and these shares) remain attractive. General Electric: GE has been a pain in our side. We purchased shares in anticipation of the dividend cut, but as the media looks further under GE's hood they see more they don't like (for example, ex-CEO Immelt used to fly around with 2 private jets, in case one had technical challenges, he could just hop on the other so as not to be late for any meetings--what a waste!... and a publicity disaster for GE). The popular narrative is that GE has very little hope, which as contrarians we like. GE still generates a lot of free cash flow, and when the narrative changes--this stock has significant upside. Health Care SPDR ETF (XLV): This is an allocation play in order to gain low-cost exposure to the sector. We have this ETF, along with healthcare sector company Johnson & Johnson--which we will cover more below. International Business Machines: This is a stock the media hates. The narrative says its a dinosaur that missed the secular cloud trend to a large extent. In our view, IBM's legacy business provides very-long term support for IBM's big attractive dividend. We believe IBM's decision to pursue a hybrid cloud approach is what this company's low-volatility-seeking-and-safe-dividend investors demanded. If you're looking for attractive income and some price appreciation, IBM is worth considering. 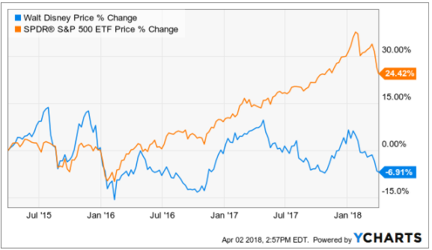 iShares Russell 2000 Value Index (IWN): This is a low-cost ETF that provides efficient exposure to the small cap value space. Small cap value has historically outperformed other styles, but it has been lagging the market in recent years, which makes it even more attractive in our view, as contrarians. These companies tend to have less exposure to international operations than large cap stocks which can provide a slightly alternative return steam, especially in light of international trade considerations. Johnson & Johnson: Johnson & Johnson is an attractive, diversified, blue chip health care company, and the recent share price pull back makes for a more attractive entry point, in our view. If you're looking for strong, steady, lower beta exposure to growth and income, JNJ is worth considering. New Residential Investment (NRZ): Management continues to evolve with the evolving residential mortgage industry, and this is what allows the company to keep growing and keep paying big dividends. This company announced strong earnings in February, and we've written about it in the past, here and here. Paylocity Holding Corp (PCTY): This is one of those smaller cloud-based, Software as a Service ("Sass") companies that investors have been excited about lately, and the excitement is warranted, in our view. Whereas ADP (discussed earlier) manages large company payroll processing and HR functions, Paylocity does it for small and mid-sized business, and does so more efficiently and less expensively that ADP. ADP is a large cap Fortune 500 stalwart, so the two businesses don't compete head-to-head often. Paylocity has room to run. Phillips 66 (PSX): Our thesis remains the same here. Paylocity is being valued like a refiner, but it should increasingly be valued like a midstream, which gives it multiple expansion potential, in our view. It has sold off this year, which makes it an even more attractive opportunity. Procter & Gamble (PG): If you're looking for steady yield with low-beta price appreciation potential, Procter and Gamble is hard not to consider. It's trusted products (e.g. toilet paper, laundry detergent, etc.) aren't going away. We own this one in our Discipline Growth and Income Equity strategies. Royce Value Trust (RVT): This is an attractive closed-end fund ("CEF"). Not only does it trade at a discount to its net asset value, but we especially like the small cap exposure. Small caps have been lagging large cap stocks even though they historically outperform, and we expect small cap in general (and this fund, in particular) to perform well going forward. Income investors often do NOT invest in small caps because they usually don't offer high yields, but this is a great way to get the attractive exposure and a large high-yield distribution yield. Royce Micro Capital Trust (RMT): This microcap stock closed-end fund is a compliment to RVT (above). It provides attractive efficient expose to micro-cap stocks, and it enjoys a discounted price, a strong management team, and big steady distribution payments for investors. Tekla World Healthcare (THW): This CEF offers big distributions to investors (current yield: 10.9%, paid monthly), the discount to NAV is larger than normal (-8.3%), and the holdings are attractive. This CEF also offers exposure to non-US markets. If you're looking for actively managed exposure to the healthcare sector with big income distributions, this CEF is worth considering. 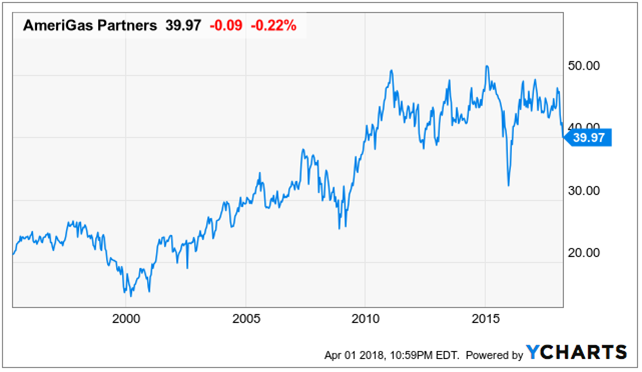 Triangle Capital Corporation (TCAP): This high-yield BDC took a hit when it announced a distribution reduction with essentially zero warning. Investors were not pleased, and the shares sold off dramatically. However, the new BDC laws that were included as part of the recent budget President Trump signed a couple weeks ago will benefit BDCs including TCAP. Specifically, BDCs are now allowed to essentially double their leverage ratios from 1x to 2x. The new rules will especially help TCAP as the cap rates on new investments are not as high as they were shortly after the financial crisis. TCAP's new investments are less risky than the old, but also less risky. And the new leverage limits will help the company maintain an attractive yield for investors. U.S. Bancorp (USB): This is an attractive large regional bank that has steady upside as the economy continues to strengthen and as interest rates continue to rise. Further regulator pressures are expected to ease. Also, USB has economic moats including cost advantages (its a very large regional bank) and high switching costs related to its business. Union Pacific Corporation (UNP): It's still cheaper to ship by rail than by truck, and UNP's access to strategic west coast ports gives it an attractive competitive advantage. EV/EVITDA has increased, put UNP is attractive on a P/E basis, especially considering the economy, the business and the dividend are all healthy and strong. Walt Disney (DIS): Many of Disney's brands are timeless, and it's forward-looking initiatives (e.g. new direct to consumer segment) give it upside price appreciation potential. Plus parks/recreation has been strong as the global economy is increasingly strong. These factors, combined with the recent sell-off, make Disney worth considering for a spot in your investment portfolio, depending on your individual needs (we own it in our Disciplined Growth portfolio). Westar Energy (WR): We sold these shares out of our Disciplined Growth portfolio, and bought ServiceNow (NOW) with the proceeds because it's a better fit for that portfolio. However, we continue to own shares of Westar in our Income Equity portfolio. We like the lower risk and steadily growing dividend these shares offer, and we like to have a utility stock holding in the Income Equity portfolio (Westar is an electric/utility company mainly in Kansas). Williams Partners (WPZ): Shares have sold-off this year, particularly as the FERC proposed policy changes that could eliminate the MLP tax allowance, thereby also lowering revenue and earnings. Nonetheless, WPZ continues to have the ability to invest in attractive cap rate projects, its simplification transaction with WMB makes it safer and more efficient, and the shares have sold off to an attractive level, especially considering the FERC is NOT in the businesses of destroying businesses. Despite the uptick in market wide volatility, we remain comfortable in the long-term positioning of our investment portfolios. Specifically, we believe they have attractive income and price appreciation potential going forward. Further, the recent market wide sell-off has made many of these positions increasingly attractive for buyers as the economy remains strong and growing. Older PostDo You Manage a Balanced Portfolio?